The Baby Stroller Blanket or crib blanket, designed by Sue, is knitted flat, on the diagonal, on 4.50mm needles using aran weight yarn. 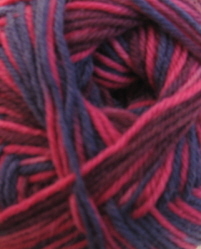 It is shown here knitted in the deliciously soft Fiore Cotton Adriafil and takes 3 x 50g balls. This pattern is for a lacy scarf and cowl The lace pattern is the same as used in our pattern for the Tiffany Stole, featured in Knit Now earlier this year. 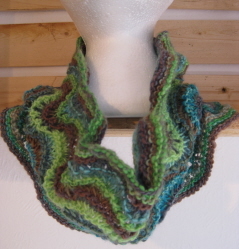 Both the scarf and cowl are knitted flat on 6.00mm needles and each uses just 100g of sock yarn. 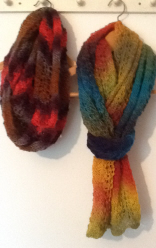 The scarf shown here is knitted in Kunstgarn colour 19. 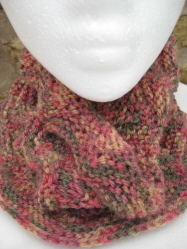 The cowl is knitted in Jawoll Magic Degrade colour 39, Rosefinch. 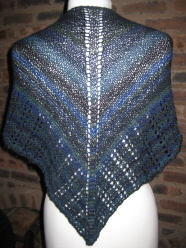 This pattern is for a cowl in a simple lace pattern based on Old Shale Lace, a classic Shetland pattern. It's ideal if you're new to lace knitting as there's a simple 4 round repeat. 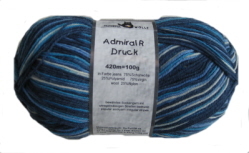 It takes just 50g of sock yarn and is a great way to show off graduated yarns. 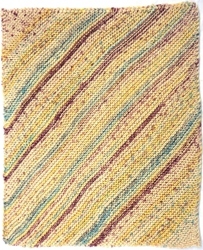 It is shown here knitted in Mille Colori Baby 016 (100% fine merino wool) but is suitable for any 4ply yarn. 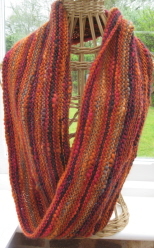 This simple garter stitch snood (or long cowl if you prefer) is knitted in the round using 2 balls of Natur Uld Flamme chunky weight wool on a 6.5mm x 80cm circular needle. It's is a quick and easy knit, ideal for anyone new to knitting in the round. This 12 row pattern is quick and easy to master. 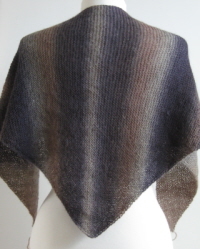 The cowl shown is knitted in Adriafil New Zealand Print 042 but the pattern is suitable for any aran-weight yarn.